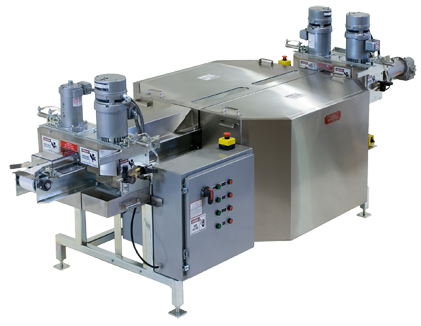 Reduce maintenance requirements and floor sprawl with the Clock Associates English Muffin Scorer-Splitter-Slicer. All three functions are accommodated in a single stretch of 12-foot conveyor. No transfers. Never lose another contract due to poor splitting. Muffins off the Clock Splitter are truly fork-split. Four variable speed, xylan-coated fork rings guarantee a finger-easy pull-apart muffin. The unit is variable speed to 300 pieces per minute and is fully adjustable. For customers requiring sliced muffins, the scorer and splitter rings retract for a center-hinge slice. Models minus the slicer are also available.